A nutritious and tasty parathas! I generally love parathas and like to try different versions of parathas. Everyday, I cook dal for my daughter. Sometimes, I would have excessmoong dal. I would try making kootu, sambar, and subzis. I felt quite bored to repeat different versions of kootu, sambar etc. using the same moong dal. 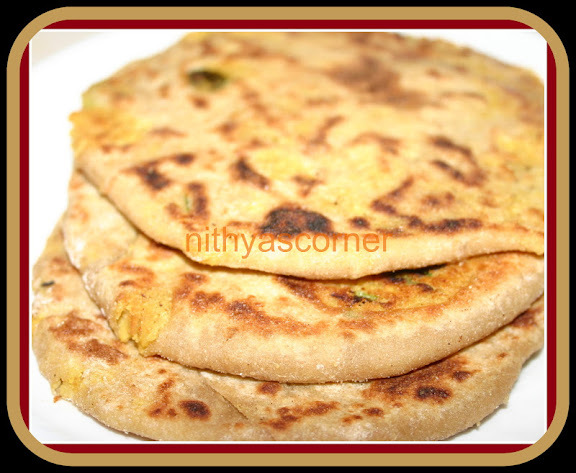 I wanted to try out something different and then when I searched a lot, I came through this recipe Moong Dal Parathas from Archana’skitchen. I tried it out, and it turned out to be very tasty parathas. Absolutely, healthy parathas. Thanks Archana’s kicthen for sharing this healthy recipe. Check out “Chappathi recipe to know how to knead the dough, make balls, roll out the chappathi, and also cook the chappathi”. 1. Drain excess water in moong dal. Add the ingredients under the masala to the dal and mix well until you can make balls out of it. Make medium sized balls and set aside. 2. Add flour and salt in a large bowl, and add water little by little. Make a pliable dough. Knead dough until it is soft and non sticky. Set aside covered for 20 minutes. 3. Make 12 – 15 lemon sized balls of the dough and roll them out to round paratha. 4. Now, put the moong dal ball in the center of the rolled paratha. Add a portion of the stuffing in the center. Gather the sides and bring the sides of the paratha together and again make a ball. 5. Again, toss it in some flour and roll it gently applying just even pressure to roll. Roll it to desired thickness. 6. In a pan, put the paratha and cook the paratha on either sides until you see the brown spots on the paratha. Put a drop of oil/ghee on the corners of the paratha. Note. Stuffed Parathas should be cooked on medium heat to get the best texture and the light crispiness. Now, Moong Dal Paratha is ready!!! This entry was posted in Paratha and tagged Moong Dal Masala, Moong Dal Paratha, Moong Dal Parathas, paratha on November 22, 2014 by vikashbhardwaz.